The odd claim that something as abstract as a place loves you grabs your attention, sticks in your head, and thus makes for a successful slogan. It also provided a reply and a challenge to the “I Love New York” slogan – and indeed, a large portion of the print ads that used the “Place that Loves You Back” showed up in New York magazine. The slogan was also meant to conjure up Philadelphia’s heritage as the “City of Brotherly Love,” infused with the Quaker values of universal love, nonviolence, tolerance, and equality. Since the city’s antisocial reputation also defined some of the city’s perceived virtues of tolerance and acceptance, it seems worth asking what shared sense of community we gave up in selling ourselves more successfully to tourists. “The Place that Loves You Back” suggests that we offered to welcome tourists into a warm and intimate community. We want you to have fun; in fact, we’re going to insist that you have fun, because we love you and we care. But in making this new offer, have we forsaken the mixed history of tolerance and indifference that allowed anyone to come here and do what he or she wanted while the rest of us didn’t care? Encyclopedia of Greater Philadelphia (Explore in Liberty Bell). Library of Congress (Explore in Girard College). Historical Society of Pennsylvania (Explore in Constitution Commemorations). PhillyHistory.org (Explore in City Hall). Visit Philadelphia (Explore in Broad Street and South Philadelphia). PhillyHistory.org (Explore in Philadelphia, the Place that Loves You Back). PhillyHistory.org (Explore in Sesquicentennial International Exposition). Photograph by Mary Rizzo (Explore in South Philadelphia). Visitors to Philadelphia remark on its impressive public buildings, churches, and cultural institutions. 1774-81: First and Second Continental Congresses. 1790s: Philadelphia is Capital of the United States. 1820s-50s: Visitors are attracted by innovations and institutions including Eastern Penitentiary, Girard College (shown here), Laurel Hill Cemetery, and Fairmount Water Works. 1824: Visit of Marquis de Lafayette creates ritual of receiving important visitors in Independence Hall. 1876: Centennial of Declaration of Independence. 1883: First Phillies baseball game. 1887: Centennial of U.S. Constitution. 1885-1915: Liberty Bell exhibited seven times outside Philadelphia at world’s fairs and exhibitions. 1901: First city-sanctioned Mummers Parade on Broad Street. 1930: Philly steak sandwich invented (Cheez Whiz comes later, 1952). 1933: First Eagles football game. 1948: Congress authorizes creation of Independence National Historical Park; demolition to create park follows in 1950s. 1950s: Automobile vacationing increases tourism to Philadelphia as Cold War-era families seek out patriotic historic sites. 1958: July Fourth celebration expands into Freedom Week festival. 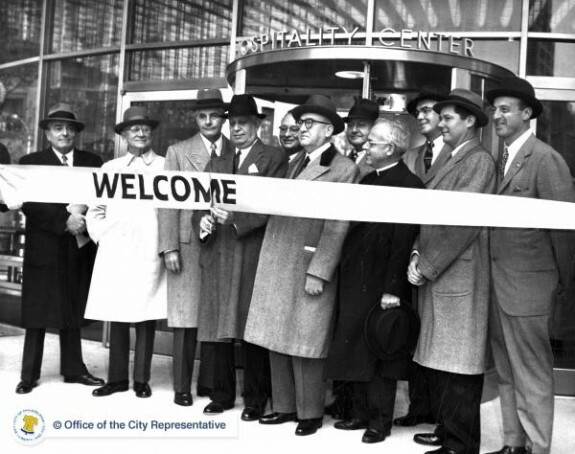 1960: New visitor center (shown here) opens near City Hall, away from traditional historic district. Tourism slogans of the 1960s include “Surprising Philadelphia” (1968), “Philadelphia Fling” (1969). 1967: First Flyers hockey game. 1974 and 1975: Flyers win the Stanley Cup. 1976: Bicentennial of Declaration of Independence, premiere of Rocky. 1993: July Fourth celebration expands into “Welcome America!” festival. 2001: Tourism industry hurt by security concerns following 9/11 attacks; new marketing program promises “Philly’s More Fun When You Sleep Over.” By 2003, domestic visitation to the region reaches 30 million for the first time. 2010: First Philadelphia Union soccer game. New attractions and institutions open: National Liberty Museum (2000), Independence Visitor Center (2001), Kimmel Center for the Performing Arts (2001), National Constitution Center (2003), Liberty Bell Center (2003), Lincoln Financial Field (2003), Fairmount Waterworks Interpretive Center (2003), Citizens Bank Park (2004), new home for Please Touch Museum (2008), President’s House Site (2010), new home for National Museum of American Jewish History (2010), new home for Barnes Foundation (2012). Baltzell, E. Digby. Puritan Boston and Quaker Philadelphia: Two Protestant Ethics and the Spirit of Class Authority and Leadership. New York: Free Press, 1979. Conn, Steven. Metropolitan Philadelphia: Living with the Presence of the Past. Philadelphia: University of Pennsylvania Press, 2006. Brightbill Postcard Collection, Library Company of Philadelphia, 1314 Locust Street, Philadelphia. Office of the City Representative Records, Philadelphia City Archives, 3101 Market Street, Philadelphia.